Happy Kitchen Sink Stamps Monday on a late Tuesday evening! Sorry for the delay in posting this week, but due to the tornadoes in the area, we were with out power for a few days. I have some fabulous KSS sale information to share with you so be sure to continue reading below! 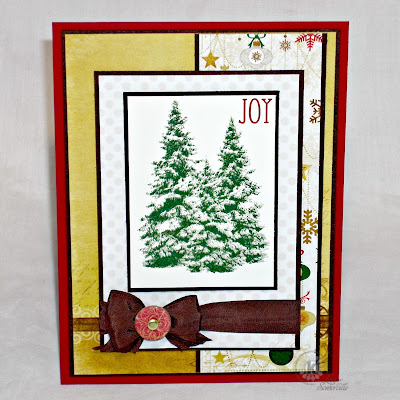 Inspired by this weeks Mojo Monday Sketch Challenge, I used Kitchen Sink Stamps Multi Step Snowy Pines and a sentiment from the Multi Step Gift stamp set. I reversed the longer panel on my card to fit the piece of pattern paper that I was using from the Bo Bunny Silver and Gold collection. 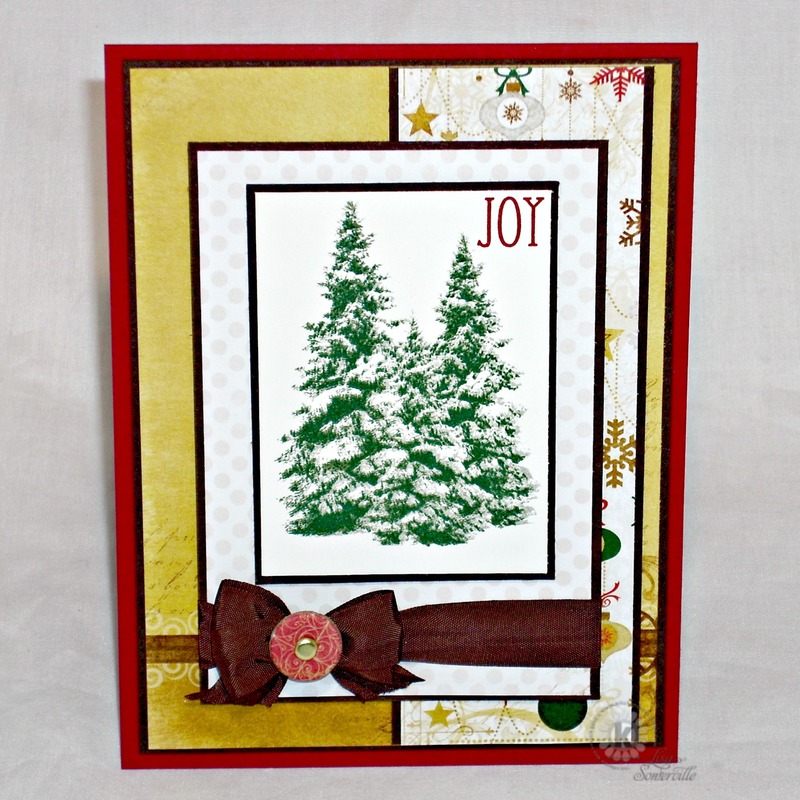 The pine trees are stamped on White card stock, with the word "joy" being added in Cherry Cobbler. To embellish I added Vintage Brown Seam Binding and a button from the Bo Bunny Silver and Gold collection with an added brad in the center. Kitchen Sink Stamps Pre Thanksgiving Day Sale! Mark your calendars, for Kitchen Sink Stamps Pre Thanksgiving Day Sale! Starting Friday Nov.22 thru Tuesday Nov. 26 midnight PST, you can save 30% off everything (except back ordered stamps) at Kitchen Sink stamps! That's not all US Customers will also receive FREE shipping when your order total $65 or more! When checking out during the Pre Thanksgiving Day Sale, simply CLICK HERE, or use coupon code THANK30LISA at checkout. Great Christmas card! I hope she is stocked up on the stamps I need for this fab sale.